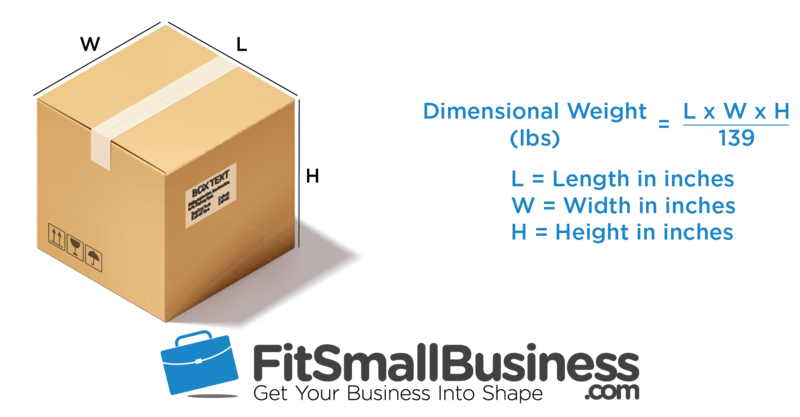 3Dimensional weight is a formula shipping companies use to apply rates based on a parcel’s length, width, and height. Also called volumetric or dim weight, it can make large lightweight parcels cost more to ship than small, heavy parcels. Our dimensional weight calculator will show the billable weight of your parcels. Simply enter the length, width, and height or your box into our dimensional weight calculator below to see its dimensional weight for FedEx and UPS shipments. Note! You need to use the outside dimensions of your box for an accurate calculation, and always round up fractional sizes to the next inch and next pound. Once you have your dimensional weight, compare that to the actual weight of your package. The greater of the two weights is your billable weight. That’s the weight your shipping rate will be based on. See how the size of your box impacts your shipping cost? Using our dim weight calculator, you can quickly compare the billable weights of different boxes to determine the most cost-effective packaging size for the items you ship. You can also use it to see if large, lightweight items are even worth selling when you factor in the dimensional weight shipping cost. Our dimensional weight calculator makes billable weight calculations quick and easy. But if you don’t have it handy, here are each carrier’s dim weight formula and examples of how the math works. So, for a 10x10x10 package, you’ll pay the 8-lb. billable rate, even if the parcel’s actual weight is just 3 lbs. But, if the actual weight is 10 lbs, you’ll pay the 10-lb. rate. Remember, the higher weight, actual or billable, is what carriers base their shipping rate on. 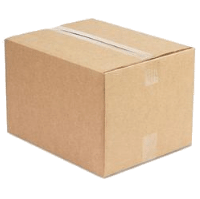 Does Dimensional Weight Apply to Every FedEx & UPS Package? Yes. In 2018, dimensional weight applies to every package you ship via FedEx & UPS, whatever shipping method you use. Note! Some outdated published information states that FedEx and UPS only apply dim weights to packages over 12x12x12 (1728 cubic inches). This is not the case in 2018. When you quote rates on each of these carriers’ websites. Both UPS and FedEx apply a dim weight to all box sizes. But the USPS doesn’t apply dimensional weights to all packages, unlike FedEx and UPS. If your package meets all 3 criteria above, USPS 2018 dimensional weights will apply. So, for a 14x14x14 package, you’ll pay the 15-lb. billable rate, even if the parcel’s actual weight is just 3 lbs. But, if the actual weight is 18 lbs, you’ll pay the 18-lb. rate. The higher weight, actual or billable, is what the USPS bases its rate on. Does Dimensional Weight Apply to Every USPS Package? In 2018, USPS only applies dimensional weight to Priority Mail (and Priority Mail Express) packages over 12x12x12 (1728 cubic inches) AND shipping to zones 5-9, based on your location. For packages of any size shipping to zones 1-4, USPS Priority Mail rates are based on the actual weight of the parcel, not dim weight. Clearly, using larger boxes than necessary is a big mistake since, in most cases, every package you ship will cost more. But there are ways to work around dim weight headaches. Here are 6 things that you need to avoid (or do) to ensure that you pay the lowest rate possible on every parcel you ship. The overall packed size of a product is something you should consider when sourcing wholesale goods or manufacturing your own. In today’s competitive ecommerce environment, charging customers the actual cost of shipping large parcels usually leads to dropped carts and lost sales. You’ll probably have to absorb some shipping costs on large shipments, but large, low-cost goods might not have enough profit to cover your losses. Plus, you have to get those goods into your fulfillment warehouse and then ship them to your customers. And remember! Dimensional weights apply to both inbound and outbound parcel shipments. Now that you understand how dim weights impact the price you pay for every parcel you ship, it’s time to closely scrutinize the boxes and mailers you use. 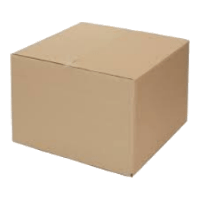 Your goal is to use the smallest box, or envelope, flat, or tube, needed to protect your item in transit. Anything more than what’s absolutely needed to protect products cuts into your profits. Plus, too-large packaging requires excessive packing materials to fill the void, adding costs. Using right-sized packaging to ship your products, is an easy way to cut wasteful spending on fill materials and shipping rates. If you ship in volume and find that ready-made boxes aren’t a perfect fit for your item, custom-made boxes can help you save on shipping in the long run. This is especially true for shipping large items, like baby gates, ottomans, or storage units. 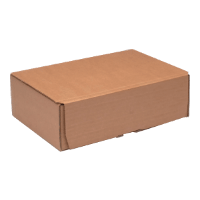 For small items that ship in boxes less than 16x16x16, you’ll find plenty of ready-made box options. But over that general size, your options decrease. Because of dim weights, using even a slightly-too-big box can dramatically increase your shipping rate on every order. FedEx and USPS both offer a flat-rate box option with rates based on the box you use, weight doesn’t apply. Have you heard the USPS commercial: If it Fits, it Ships. That’s their flat-rate program. Now, it’s not right for many shippers, but if you sell small, heavy items, like spices, tools, engine parts, and so on, flat-rate boxes can provide a lower rate. Plus, you don’t have to pay for boxes since they’re provided with the service. If you ship in volume, you can save a lot by simply comparing shipping rates among the different carriers for every package you ship. Most shipping comparison systems like ShippingEasy, Ordoro, and ShipStation make both rate and time-in-transit comparisons fast and easy. That way, you know you’re getting the best possible rate on every package you ship while providing the fastest service to your customers. Whether you ship occasionally or daily, dimensional weights matter to your business. If you primarily use FedEx and UPS, every parcel that you ship is subject to dimensional weight. That means every extra inch of packaging that you ship costs you more. When shipping with these carriers, it’s a good idea to run every parcel through a dimensional weight calculator to get the billable weight, based on box size. USPS is a bit more forgiving. It only applies dimensional weights to packages over 12x12x12 (1728 cubic inches) shipping relatively far, to zones 5-9, based on your location. Knowing how FedEx, UPS, and USPS dimensional weight formulas work, and how billable weights affect the parcels you ship, is the first step in controlling your shipping costs. With that knowledge, you can scrutinize your packaging and look at alternatives that can help you lower your shipping costs. That might be using FedEx or USPS flat-rate boxes for some or all shipments, or looking into custom boxes to minimize dim weights on large shipments. After that, you can look at other ways to cut your shipping spend. Comparing rates across carriers using rate-comparison shipping software is a great place to start. And understanding surcharges, and how to avoid them whenever possible, can also reduce your rates. Rate-comparison software can help you there, too. How do dimensional weights affect your business, and what do you do to minimize their impact on your profits? Have you switched carriers, adjusted your packaging, or even changed your product line to ship smaller, less-costly items? We’d love to hear how you deal with dim weights in the comments below. Good info. but your dim weight calculator (near the beginning of this article) is not rounding up! As noted above the calculator, you’ll want to round your dimensions and weights when entering this information into the calculator. Carriers round up each element, not the completed total. If your box is 11.5×11.5×9.25, enter 12x12x10, if your weight is 2.5, enter 3. As a shipper, it’s helpful to think in the next whole number up when dealing with weights and dimensions since that’s how the carriers work. Hope this helps!